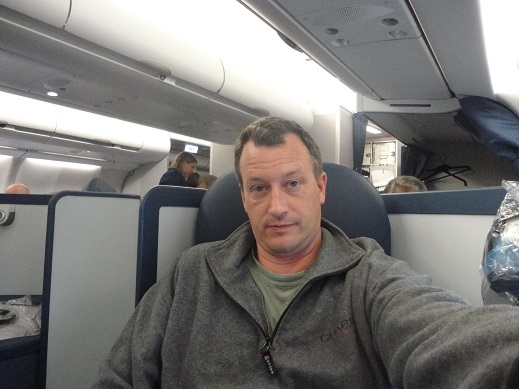 On the plane home, looking tired after Sardinia and the Camargue. There is a fascinating Russian film titled Burnt by the Sun, which manages to put an interesting spin on the most repressive Stalinist period of Soviet history. The analogy here is that Russian society was “burnt by the sun” of the revolution, which like the summer sun that leaves us burnt, was so brilliant that some were “burned” by its energy. One could consign this to mere apologetics that fails to take the victims of Stalinism seriously, but it is a good film, and a morally serious film, that is not so easily dismissed. 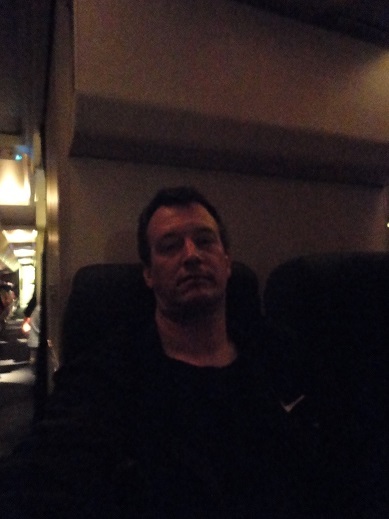 On the plane home from Lima, looking tired. In a literal, rather than a metaphorical sense, I often feel burnt by the sun after one of my touring holidays. At home, I lead a primarily nocturnal life, working mostly at night, and so am little exposed to the sun. It is different on holiday. Sightseeing can be surprisingly hard work if you take it seriously — and I do take it seriously. There is nothing else that has taught me as much as travel. So I push myself pretty hard, walking hour after hour through towns and museums in the heat of the day when such sights are open and available to the public. And I am part of that sightseeing public. 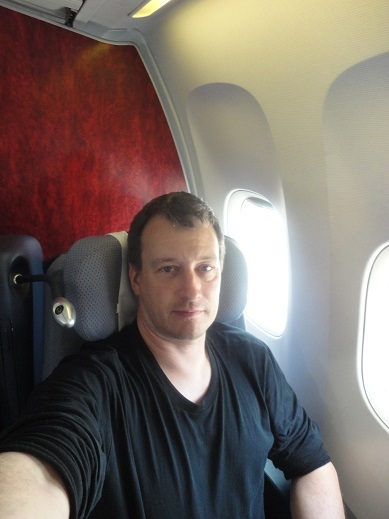 Another time flying home from Lima, and looking tired again. I have shuffled through with the masses because it was that or nothing — Hobson’s choice in the acquisition of the Western tradition. Like the velvet ropes that restrained my access to the Strahov Monastery library that I mentioned in In Praise of Private Libraries — but which were held aside for others with better connections — these symbolic barriers separate us from another life that is denied us. 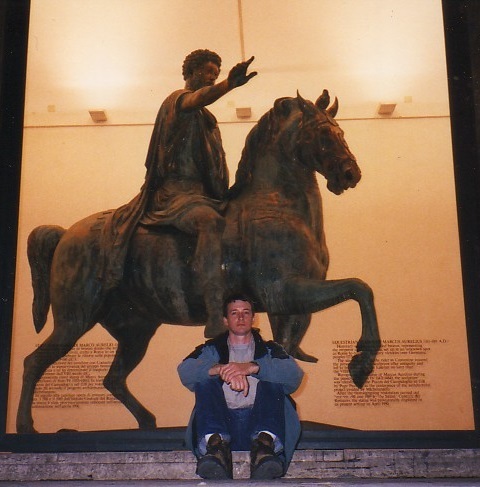 Looking tired on my last day in Rome in the fall of 1997. Just so, for ten days or two weeks a working class individual from the industrialized world can live like the one percent, but then the interval passes and we return to our place and position and society, only because we lack the resources to continue. 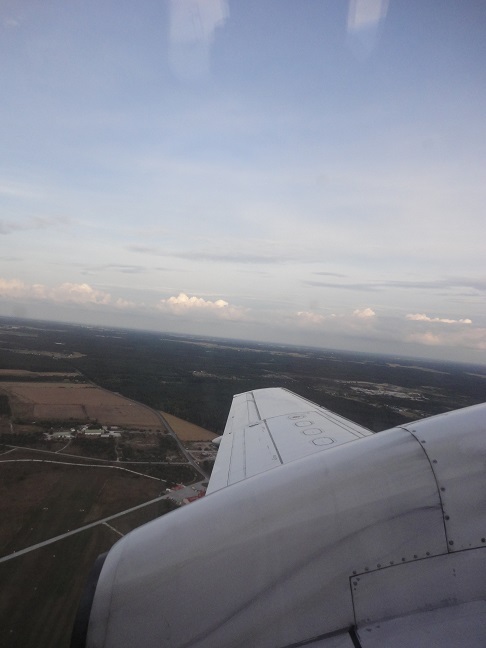 Coming back can be difficult; in fact, for me it seems to get increasingly difficult. Perhaps for others it is different. 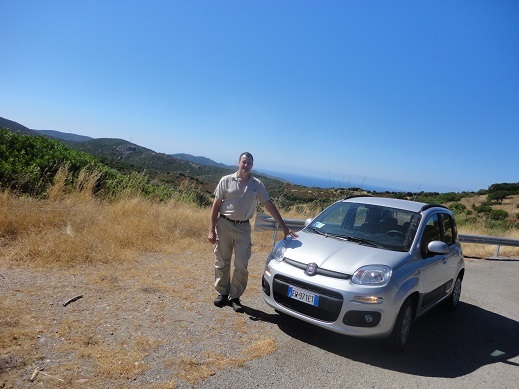 But now I sit at my desk, burned by the sun, and daydream of Sardinia. Feria du Cheval activities in the streets of Saintes-Maries-de-la-Mer. 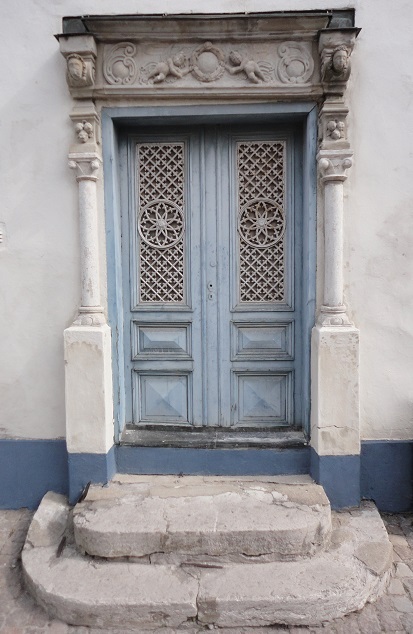 Saintes-Maries-de-la-Mer is a charming beach town that, like Aigues-Mortes, is not spoiled by its touristic character. There are many restaurants and hotels, and a lively street life based around the tourist trade. There is also a lot of beach front here, which attracts a lot of families with children, who were taking the sun and playing in the surf. 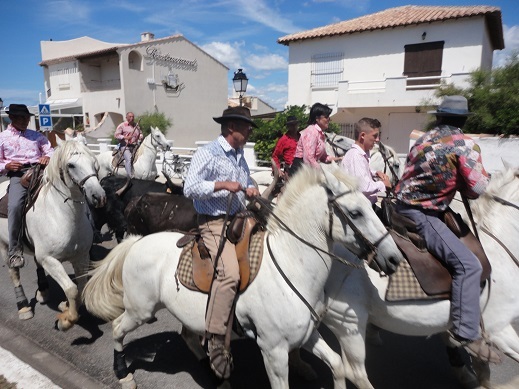 Without planning it, I happened to arrive at Saintes-Maries-de-la-Mer during the annual Feria du Cheval, with events from morning until late into the night associated with the horse culture of the region. 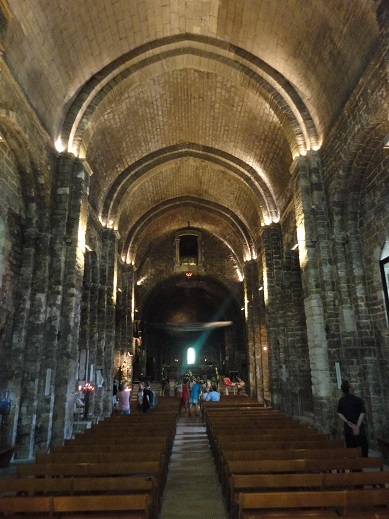 The pilgrimage church at Saintes-Maries-de-la-Mer is Romaneque in spirit, but has a transitional vault of lancet arches. The Camargue is known for its white horses, which are very much in evidence wherever you drive in the region. There are numerous ranches and tourist businesses advertising horse riding. The Feria du Cheval puts the horses at center stage for several days, as well as the strongly Spanish-influenced culture of the region, which seems to go hand-in-hand with equestrian culture. Food, music, dance, and equestrian activities were all influenced by Spanish equestrian culture, though the language was always French. 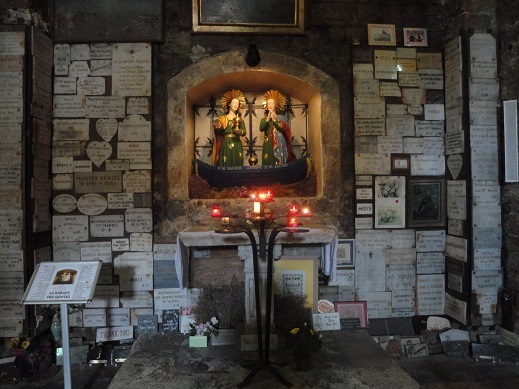 The three saints Mary Magdalene, Mary Salome and Mary Jacobe are the focus of devotions at the pilgrimage church. In addition to the Feria du Cheval, it is also Bastille Day, symbolically recognized as the anniversary of the beginning of the French Revolution, when on 14 July 1789 the Bastille, a prison and symbol of French royal authority, was taken over and occupied by the Bourgeois Militia of Paris (i.e., rioters), which had earlier the same day stormed Les Invalides for firearms, and now wanted the gunpowder stored at the Bastille. 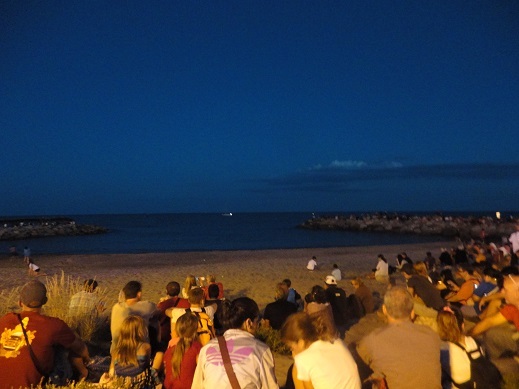 Spectators gathered on the beach at Saintes-Maries-de-la-Mer waiting for Bastille Day fireworks. Saintes-Maries-de-la-Mer was packed and busy on Bastille Day, and as evening came people began to assemble on the beach. It seemed pretty obvious that a fireworks display was planned, as I had seen similar expectant crowds on the beach in my childhood at Seaside, Oregon, for the 4th of July fireworks displayed. 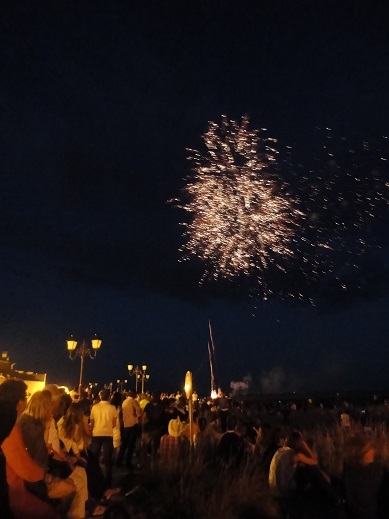 Given that I began this journey the day after 4th of July, having seen some of the fireworks, I feel that I have come full circle in this particular voyage with the Bastille Day fireworks at Saintes-Maries-de-la-Mer. Saintes-Maries-de-la-Mer fireworks display for Bastille Day. One hundred years ago in July, 1914, as the July Crisis slowly gained momentum, much of Europe went on vacation. Like a classic exponential growth curve, the July Crisis began as a gradual and shallow escalation, and it was not until later in the month that the curve of escalation reached its inflection point and began to shoot upward. At the beginning, very little happened. Immediately after giving carte blanche to Austria-Hungary for any actions it might take to punish the Serbs, the Kaiser left Berlin for Kiel to sail for Norwegian waters aboard his yacht, the Hohenzollern. The day before, German Foreign Minister Gottlieb von Jagow left for his honeymoon in Lucerne — it would seem that no great sense of crisis attended the early days of the July Crisis, and no great weight was attached to decisions made at this time, which at least partially explains the Kaiser’s readiness to grant Austria-Hungary carte blanche backing in dealing with Serbia. I, too, have departed for a summer vacation. Though I usually don’t travel in high summer (in the northern hemisphere), and I usually don’t travel to Europe during the season (since it is crowded and expensive), I thought that Sardinia would be sufficiently off the beaten path of tourist traffic to be spared the brunt of the traffic and would be bearable. So far, I have been right. Maybe it is simply because buses can’t drive directly from the continent that reduces the absolute numbers of tourism. There is something about islands that makes them different — and long before buses were an issue. Islands tend to inspire particularism, as well as loyalty to this particularist alternative to nationalism. 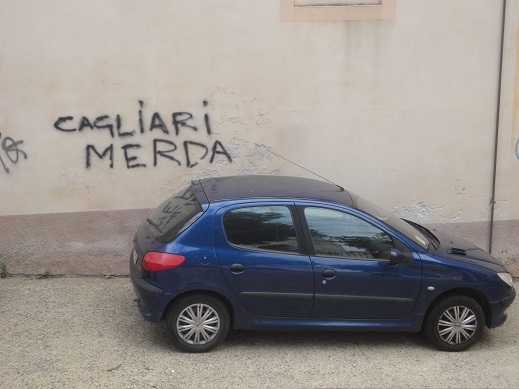 This is very much in evidence in Sardinia. 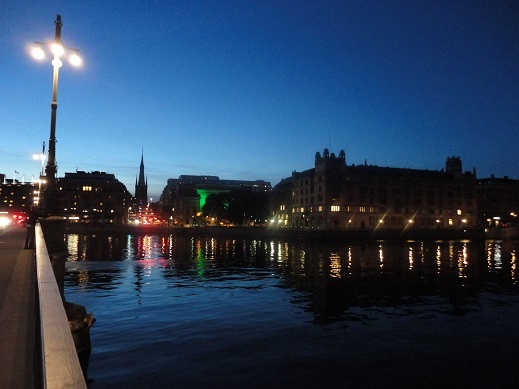 Stockholm, as I noted previously, has been called the “Summer City,” and its enviable position on the coast, extending out into the Baltic by way of a chain of islands . In so far as the Stockholm archipelago is an extension of Stockholm, we might call the Stockholm archipelago the “summer islands.” Certainly for me the Stockholm archipelago turned out to be the “summer islands,” as my time here consisted of bright, clear, sunny skies without a cloud in sight — pleasantly warm, but not hot, even during high summer in mid-August. That is weather than I can appreciate, as anything hotter than Stockholm would probably be uncomfortable for me. 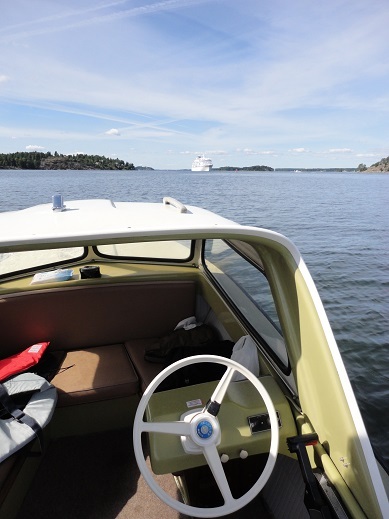 When my sister and I initially planned this trip we had another itinerary in mind, but plans change, as they tend to do, and we opted for islands, as neither of us had visited the Stockholm archipelago but had heard of it throughout our lives. Our travel in the Stocholm archipelago took us to islands as small as that of the Kasallet, off Vaxholm, and the small island where we ate lunch when we rented a boat (either of which could be walked around in ten minutes), to the mid-sized Sandhamn, which it took two or three hours to walk the circumference, and lastly to Gotland, which would probably take days to circumambulate. Interestingly, diminutive Sandhamn also had a tiny town, which was more like a village. Larger Gotland has Visby, which is a good sized town which could perhaps be called a city. And Stockholm, which is on the mainland, is much larger than these others. It is almost as though the familiar principle of island biogeography, that species confined to an island tend to evolve into smaller sizes, also holds for cities. Tennyson would have recognized this flower in the crannied wall of Visby’s ruins. Visby is large enough and old enough to have had an eventful and colorful history. I would compare it to the role of Cyprus or Malta in the Mediterranean: it is a strategic crossroads of the Baltic that has tempted many invaders and occupiers over time. And the usually peaceful Hanseatic League, which was primarily interested in trade, here got entangled in an urban/rural conflict that led to open battle for control of the island. 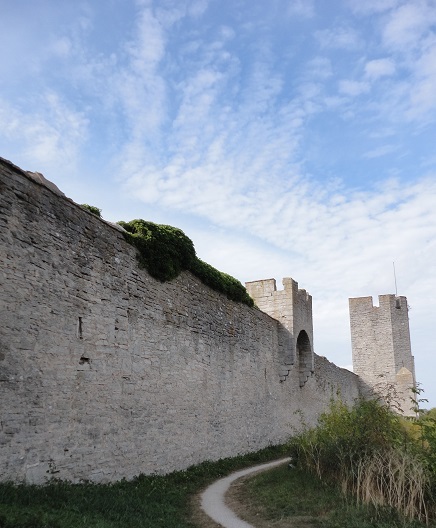 I have mentioned several times that Visby is sometimes called “the city of roses and ruins.” Of course, there are cities all over Europe with picturesque ruins of town walls and great buildings. After a certain time in history, town walls were no longer relevant to defense, and later still became an impediment to growth. This explains the ruined town walls throughout Europe. Usually, when we see a large number of ruined buildings in a concentrated area, there is a good reason for it, even if we don’t know the reason. 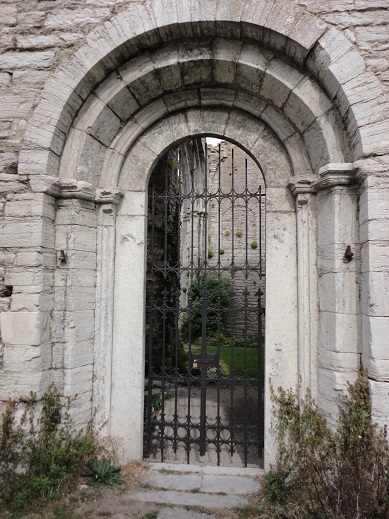 Many people who travel to England view the many ruined abbeys and monasteries there, without realizing that their number is the direct result of Henry VIII dissolving the monasteries and expropriating their lands and revenues for the crown. Elsewhere, where there are entire ruined towns or cities, there is a traumatic story behind how an entire urban area fell into ruin. 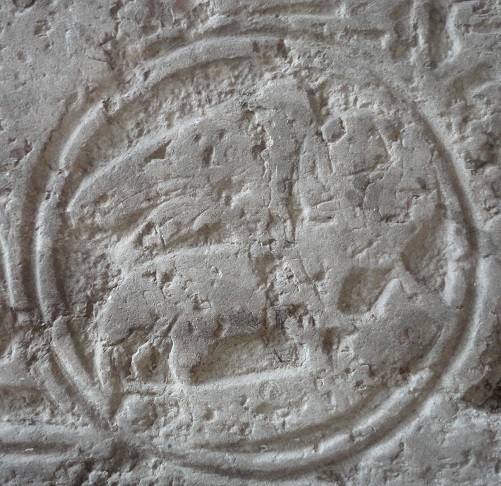 A ruined carving from a ruined gravestone in a ruined church in Visby. In Visby, I was unable to discover any single, unified reason for the large number of large ruins in with the old walled city itself. Each ruin has a plaque in both Swedish and English that describes the building, and a little about its history and had it came to be abandoned. While the stories were similar, they did not point to a single historical cause. 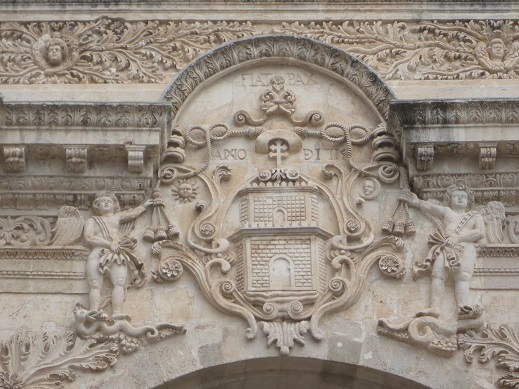 It is almost as though the Gotlanders had simply lost interest and allowed these great churches to decay and fall into disrepair, then ruin — much as contemporary Europe has largely lost interest in its religious tradition and is, for all intents and purposes, secularized (an historical category now held in low esteem, but one that I would like to rehabilitate). Europe remains today a post-Christian remnant of Christendom. Did the Gotlanders get there first? 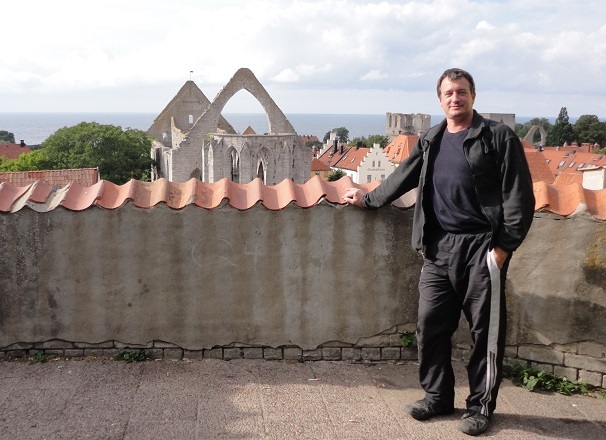 Was Visby an (unexpected) glimpse of the secular future of Europe? 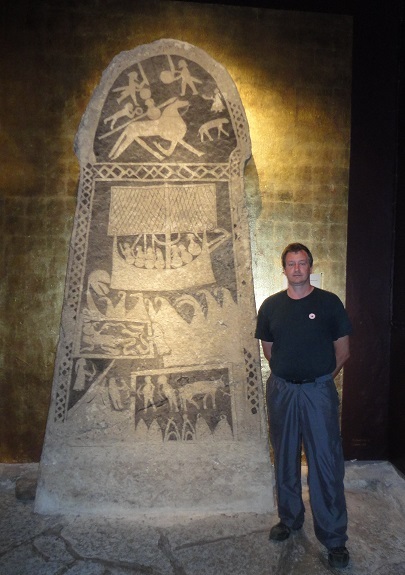 The displays in the Gotlands Museum emphasized the wealth and prosperity of Visby during the middle ages, and wealth is often if not always an occasion for the development of high culture and advanced ideas. Now, I am not seriously suggesting this as an historical interpretation, but it is an interesting idea to play with. 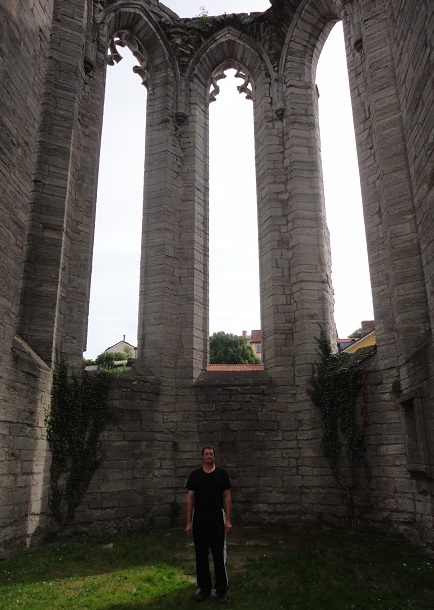 Below is a picture of me in one of Visby’s ruins, looking for all the world like a Caspar David Friedrich painting. 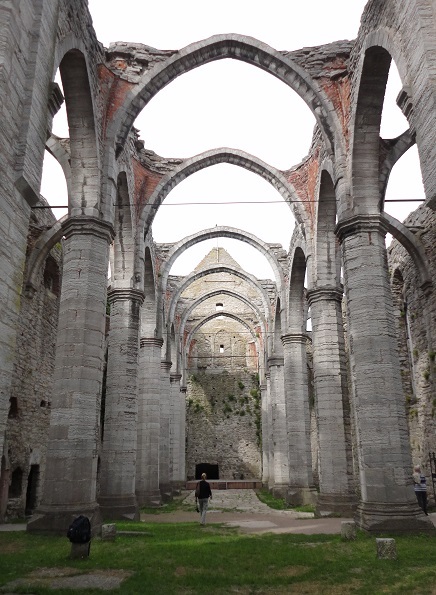 It is also interesting to play with the idea of ruins in the paintings of Caspar David Friedrich, in which ruined churches in particular play a prominent role. Many art critics have seen romanticist symbolism in this portrayal, but perhaps Friedrich was simply fascinated by ruins. (And was Albert Speer influenced by Friedrich in his Ruinenwerttheorie?) Perhaps the Gotlanders allowed their ruins to stand rather than clearing them away because they found them to be beautiful in their ruined state. What Le Corbusier was reacting against in his manifesto was the traditional European house, the old-world house, as it calls it. It is probably pointless to ask if a manifesto is right or wrong, as it is the nature of a manifesto to be polemical, i.e., rhetorical, and therefore not meant to be held to standards of logic or reason applicable elsewhere. It is probably more helpful to go into the detail of what Le Corbusier was condemning in the traditional house: citing his litany of “Baths, sun, hot-water, cold-water, warmth at will, conservation of food, hygiene” we can obtain, by way of the via negativa, his image of the traditional house. In many respects, Le Corbusier was completely justified. Let me try to explain. 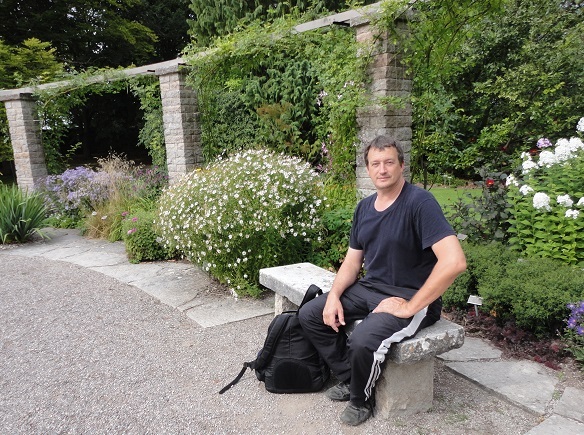 I have mentioned in past posts by interest in seeking out open-air museums in Europe. Last year I mentioned the Hardanger open-air museum at Utne and the Sogn open-air museum near Sogndal. 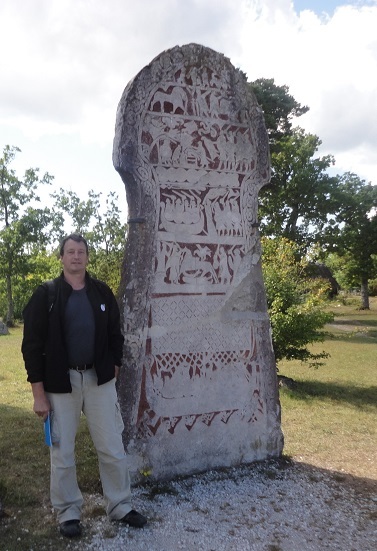 Today I visited an open-air museum in the north of Gotland at Bunge, the Bungemuseet, which not only collects many traditional houses and rural industrial buildings together, but also includes many picture stones as I mentioned yesterday. The traditional houses preserved in open-air museums have a certain kind of rustic beauty, though this may not correspond to Le Corbusier’s canon of “beauty in the sense of good proportion.” I admit I am fascinated by these old houses, and take any opportunity I have to visit them. But as much as I am enthralled by them, I can see that Le Corbusier was right. If you have never lived in an old house you may not understand what Le Corbusier is talking about when he writes of, “warmth at will,” but I can assure you from personal experience that older, drafty houses heated by woodstoves do not give warmth at will. Most houses today do give warmth at will, so people have forgotten what a great advance over the past this is. As for the rest of Le Corbusier’s litany, these houses had no running water, much less hot and cold running water. They had no indoor bathrooms, showers, or bathtubs. The Windows are small and dim, letting in little light. Their kitchens have no modern conveniences or appliances, so there was no conservation of food. Le Corbusier focused on the needs of the body, but the needs of the mind are equally wanting. When I look around these cramped homes in which people like my ancestors lived, I realize how little intellectual stimulation they had. Even in the midst of civilization, it seems, having entered into a social contract, life can be “poor, nasty, brutish, and short” — in Hobbes’ famous phrase — but it was not likely solitary. People had to live closely packed together just to survive. It is always humbling to me to see the conditions under which our ancestors lived, and to reflect how far we have come, and how quickly. But I also observe the remarkable level of technology involved in even the most rudimentary dwelling, and the way of life it implies. If a house is a machine for living in, as Le Corbusier said, then different houses are different machines, and each housing mechanism is integrated into a particular technology of living. In my many visits to museums I have, example, seen many traditional spinning wheels. Some of these are very rudimentary and easy to understand, but the later ones from the 19th century, before the industrial revolution rendered then all obsolete, are quite complex and could only be operated by someone with a significant level of skill and knowledge in this particular technology. I suspect that if a person started with the simplest spinning wheel and used it for a while, the limitations would become obvious over time, and you might begin to see how and why the additional complexities were introduced; one might, in this fashion, ontogenetically reconstruct the phylogeny of a technology. An entire house, even a traditional house, as a machine for living in, is like the spinning wheel, and to live in a house according to the way of life for which it was designed is to understand why it was built in the way it was built. But we don’t get to live in the houses and rooms we see in museums; we observe them briefly, and so we do not really understand them. 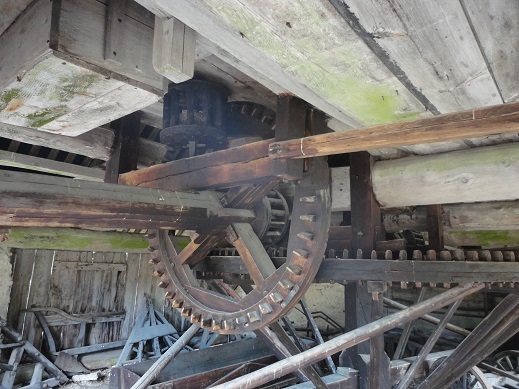 The Gotland open-air museum also displayed a large number of structures associated with rural industries, including an unusual wind-driven saw. Most of these mechanisms were beyond being brought back into service, although I turned the crank on one old mechanism and its wooden teeth and gears still meshed perfectly and I suspect the machine was still useable. But I didn’t know what it was for; I didn’t understand its function. These several literally “cottage” industries all involved the production of the most basic necessities of life — the production of food and clothing — and the industrial processes behind them were surprisingly complex, involving many stages of production and specialized workers. The lives of these workers, in turn, would have reflected their involvement with the industries they have masters. Rural characters such as the butcher, the baker, and the candlestick maker — not to mention the blacksmith, the carpenter, and the miller — are as familiar in the stories we still retain from those times as the social roles of today that represent industrialized society (banker, salesman, clerk, mechanic, etc.). This made me think of the Vasa warship that I recently saw in Stockholm, which was not only enormous, but also a highly specialized and intricate piece of technology. If you took a few hundred intelligent and and educated persons of today and put them on the Vasa as its crew, they literally would not even know where to begin to get the ship underway. Our advanced technology and engineering knowledge does not replace or supersede the technological and engineering knowledge of our ancestors; we could no more cope with their world than they could cope with ours — though either, given the time, could learn the life of the other. The technologies of living are many and various; the lives of individuals are integrated into a technology of living that is adapted to their place and time, and houses in which they individuals live are both technologies in and of themselves as well as being integrated into a wider technological context. What is this wider technological context? Adam Smith’s famous example of the woolen coat furnishes us with the perfect example of technological synchrony. If we think through Smith’s imaginative litany of craftsmen, and reflect on the fact that such a list could be made much longer and with much greater detail, we can better understand how technological change introduced within this complex synchronic web of inter-dependencies must of necessity only slowly make its impact felt throughout the whole system of production. However, all of these innovations are occurring in the same parallel, synchronic fashion, and these collected innovations incrementally affecting the whole slowly lead to changes to the whole, though it is difficult in the extreme of indicate any one point of transition. The temptation is to identify and name a decisive point of transition, but this is a falsification of history. Our lives, and the mechanisms by which we live it — our technology of living, as it were — are as integrated into a technological context as were the lives of our ancestors. These technologies are very different, so different in fact that it is difficult to discern the underlying continuity that led from the one to the other, but it was countless small changes that added up to the transition from the subsistence agriculture of agrarian-ecclesiastical civilization to the escalating production powers of industrial-technological civilization. After a night in Stockholm my sister and I booked passage on a ship to Gotland. This requires a bus journey of about an hour to the ferry landing and then the ferry passage itself which took several hours. We were off the ship on Gotland before 3:00 pm and walked to our room in the oldest part of visby, still surrounded by its medieval walls. Visby, the largest city on Gotland, is sometimes called “The City of Roses and Ruins,” and indeed within minutes of arrival both roses and ruins are to be seen. There is also a display relating to the Battle of Visby in 1361, when rural Gotlanders rebelled against the growing control of Visby by the Hanseatic League. The Hanseatic League was essentially a transnational corporation of the late medieval period which operated around the cities of the Baltic, much as the commerce of the Roman Empire operated around the cities of the Mediterranean (I wrote about the Hanseatic League last year when I visited the Hanseatic museum in Bergen, Norway, which was another major depot for the Hansa). The remains of soldiers killed in the Battle of Visby were interred in a mass grave, still in their armor, and the excavation of this mass grave of medieval war casualties has provided significant historical knowledge about medieval arms and armor and the kind of damaged inflicted on the human body in such combat. This has been made famous by John Keegan’s book, The Face of Battle, since a picture of a skull in chainmail is used for the cover the paperback edition. In addition to these finds, there is also a wide range of other material on the history of Gotland and Visby, including Viking treasure hoards and a striking medieval baptismal font. 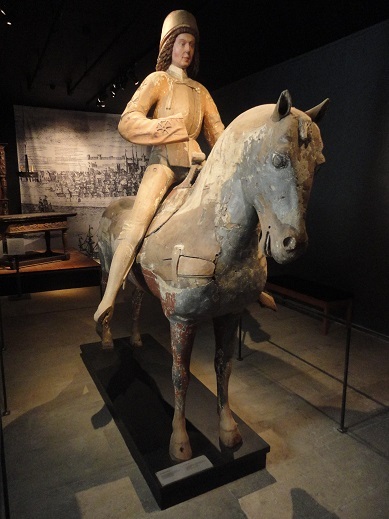 A wooden equestrian statue from the Gotlands Museum. 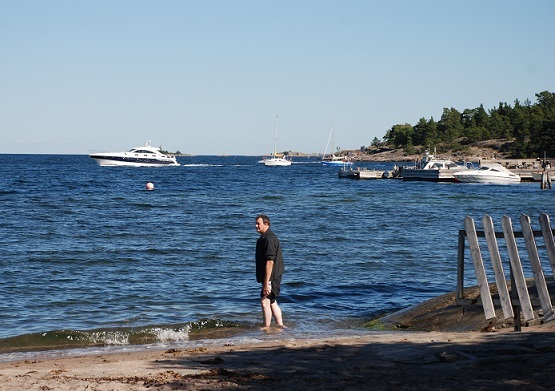 The day began on Sandhamn, and a beautiful day it was — a perfect day for a walk on the beach. 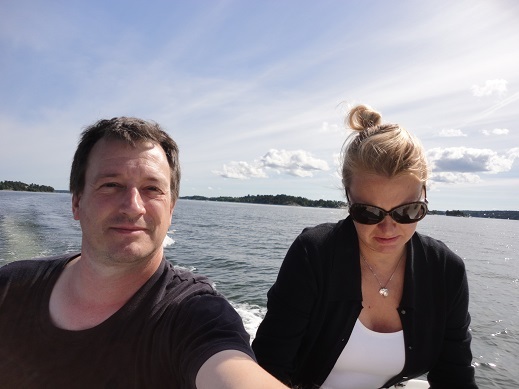 So my sister and I set out to circumambulate Sandhamn. Sandhamn is large enough to do a complete walk around in a couple of hours, which is about what it took us. Much of the center of the island is covered in a pine forest, while houses dot the shoreline and extend a little way inland. Besides the main gravel path across the island there are numerous trails that lead through the pine forest. Some of the waterfront is private and fenced off, but quite a bit of it is accessible beach (perhaps half or more). It was a good walk, but left both of of feeling tired walking in the sand and loose gravel. After circumambulating the island it was time for us to go, so we boarded the ferry back to Stockholm and in two hours are back in the heart of Stockholm. 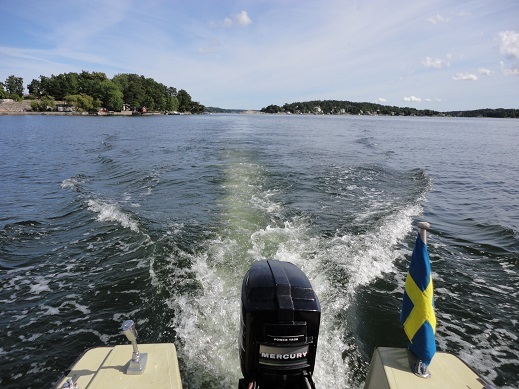 Having started in Stockholm and then headed out to Vaxholm and Sandhamn in the Sotckholm archipelago, Stockholm now stands out more clearly in my mind as a result of the contrast. 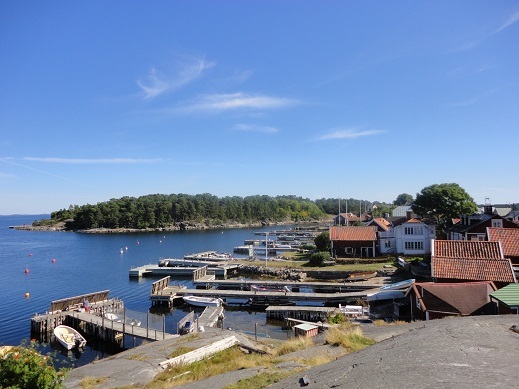 Sandhamn is a typical island community that is centered on the boat traffic that is its lifeline; it is about as small as a community can be and still have some identifiable sense of community. Stockholm is larger by many orders of magnitude. Stockholm is not only one of the great European capitals, renowned for its museums, its history, its cityscape, and its cuisine, Stockholm is also a global city. All the peoples of the world can be seen — and heard — on the streets of Stockholm, which has a decidedly international flavor. While this is obvious prima facie, it is all the more obvious now that I compare it to the intensely local character of life on Sandhamn. Speaking of the cuisine of a world-class city like Stockholm, I should mention that despite Stockholm being an essentially global city, it still retains a traditional Swedish character, and part of this character is expressed in its cuisine. There are, in Stockholm today, many ethnic restaurants, many fast food establishments, and probably a great many restaurants serving what has come to be called “international” food. Yet there are also some traditional Swedish restaurants, and among these I want to particularly mention Den Gyldene Freden. 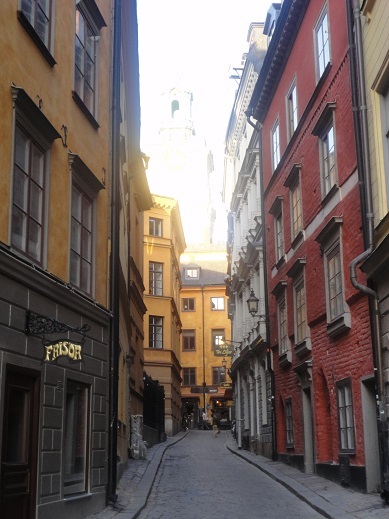 This restaurant has been in operation in Stockholm’s Gamla Stan since 1722. My sister found it when researching restaurants in Stockholm, so we made a point of going there. 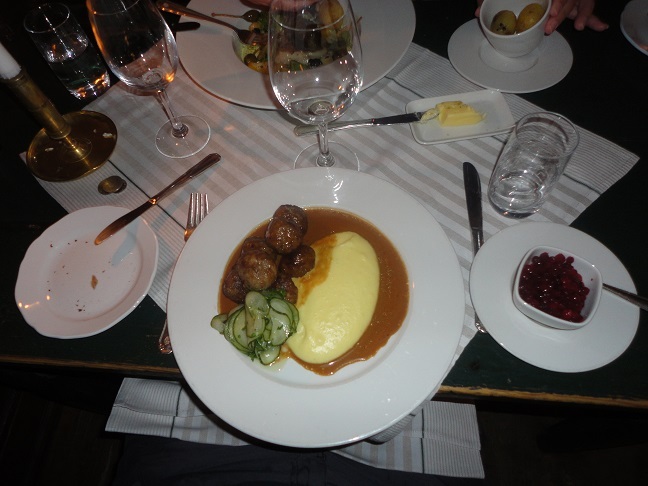 My dinner at Den Gyldene Freden was not only excellent — I had traditional Swedish meatballs — but also turned out to be a personal and even a sentimental experience. Let me try to explain. During my formative years, my maternal grandmother did a lot of cooking for my sisters and me. (My grandmother stands in that maternal line of mitochondrial DNA going directly back to Sweden that I mentioned in The Land of My Foremothers.) My grandmother made a distinctive brown bread that I particularly enjoyed. When my sister and I ate at Den Gyldene Freden the server brought round an overflowing basket of bread from which we could choose. Both of us choose the brown bread, and as soon as I tasted it I said to my sister, “This is exactly the same taste as the brownbread that our grandmother made.” My sister tasted her piece of brown bread and agreed. The particular dishes and cooking specialties prepared by a particular individual are, like Shakespeare noted of personal virtues, oft interred with their bones. We retain in memory something of the taste of foods we assume we will never taste again, just as we retain in memory the likes the the dislikes, the interests and preferences, the personal quirks and eccentricities of the dead. And then we see a descendent who, in some offhand gesture or attitude, surprises us in their perfect resemblance to the deceased. I have just experienced the culinary equivalent of this: it is as though my grandmother were briefly present again in the taste of the brown bread at Den Gyldene Freden. If I have managed to convey this experience, you will understand that this was more than merely a meal to me. 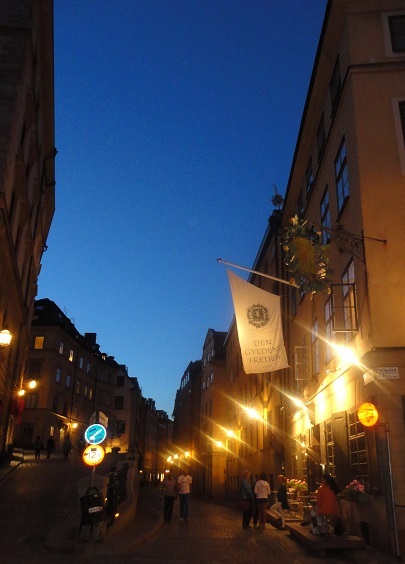 It was a beautiful evening in Stockholm, and as we walked in Gamla Stan after this memorable meal we took pictures of the sights of the city in the late twilight. 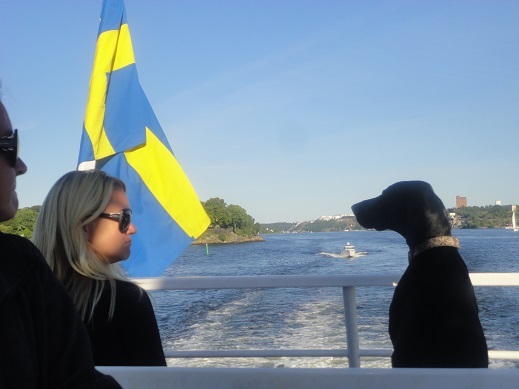 Today we took the same ferry line that got us from Stockholm to Vaxholm farther out into the Stockholm archipelago. 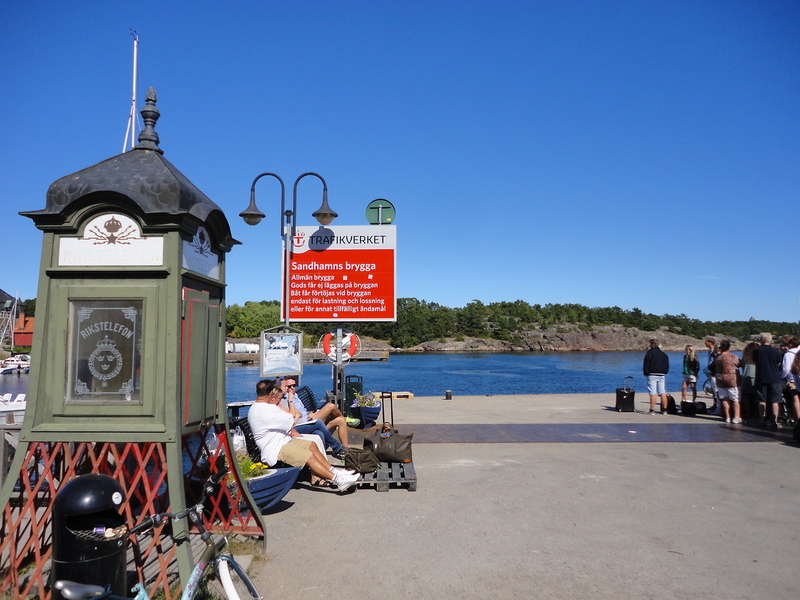 The ferry terminates at Sandhamn, which is a small island without paved roads and mostly without cars (I saw one car). There are gravel walking paths covering the island, and there isn’t really much point in having a car here, since everything is within a 20 minute walk. 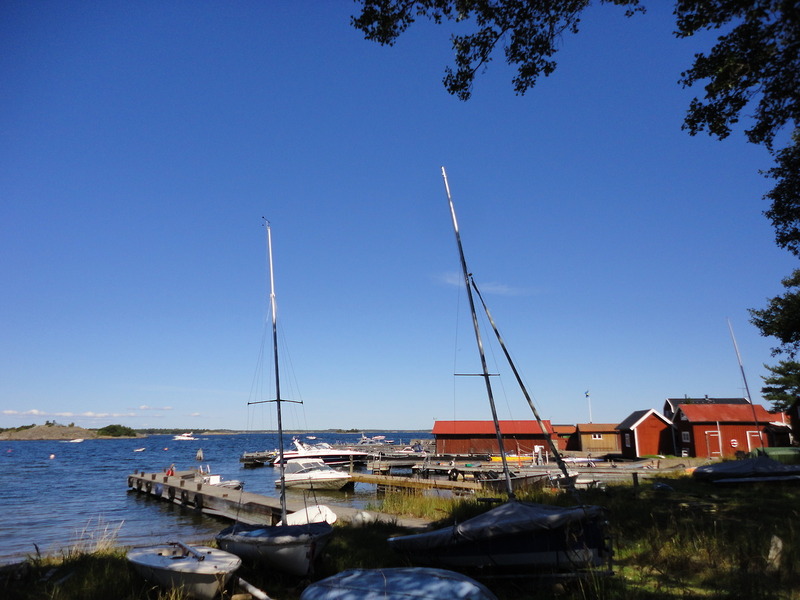 Most of the islands of the Stockholm archipelago are rocky, but Sandhamn has a couple of small sandy beaches. The port feels very much like a beach town that does a significant trade with boaters. 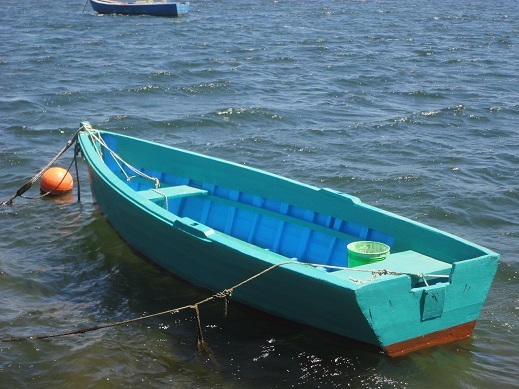 Boating seems to be the primary activity here, with the harbor filled with sailing boats and power yachts. There is one large hotel and several restaurants.